Born in San Francisco and raised in Northern California, Mary Jane calls Truckee her hometown, although she has lived in Las Vegas for the past 20 years. She has been married to her husband, Ray, for 18 years and together they have four children, two adult sons, one who was recently married and lives in San Diego and the other a City of Las Vegas Firefighter/Medic, and a daughter and a son, both in middle school, at home. Mary Jane has worked with her brother, Bill, in Real Estate, since moving to Las Vegas in 1997, helping him to run and manage his brokerage firm. Since having children, she only works part time, which gives her time to do the things she loves, which include volunteering in the schools, serving on the Women’s Council and volunteering at her church and, of course, quilting. Mary Jane first learned to quilt when the quilting ministry, Threads of Fellowship, started at her church almost 12 years ago. Her first quilts were BQ2’s she made for her two youngest children and she’s been hooked ever since. She runs the “All Day” quilting events at her church four times a year and helps with the quilting ministry there as well. Besides quilting, Mary Jane loves to bake. Cake decorating is a hobby that she has enjoyed since she was 15 years old. Since that time, she has made many wedding cakes for family and friends, including her own wedding cake. She also loves camping in her RV with family and friends and occasionally takes her sewing machine on long trips. A member of the Las Vegas Astronomical Society, she and her family take annual “Star” trips to view constellations with the group. She and her family, along with 15 others from the Society, recently travelled to Rexburg, ID to view the total eclipse of the sun on August 21, 2017. Mary Jane has been a member of DQN since 2014, and has been a volunteer for the Quilt Retreat and for the Quilt Show. 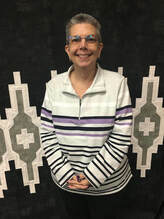 She loves the heritage of quilting and values the knowledge and skill of those within DQN and is always appreciative when others are willing to share that knowledge and skill with her. Cory Allender was born in southeastern Michigan and spent her life there until she and her husband, an automotive engineer, moved to St. George, Utah, 15 years ago. When she was a child, her mother and god mother taught her how to sew, knit, and crochet. Her mother-in-law taught her how to hand piece and hand quilt 30 years ago. She has been longarming for the past 14 years and taught longarming at Let’s Quilt in St. George. As an only child not blessed with children, her own work consists of competition quilts which, after they finish their show run, are given to the person who bonds with them. She is a member of Art Quilts, Etc. and Hand Jivers, as well as Co-Chair of the Judging Room for QLV. She finds the creativity and inclusiveness of DQN to be more than worth the drive to Las Vegas and is very proud to be a member of the Guild.